Hi everyone. Spent yesterday in my studio with two wonderful, crafty friends ... Susan and Christine. We met through Splitcoaststampers, which is an amazing community of wonderful crafters. We meet up about once a month or so, to have a play day. :) Yesterday we experimented with different types of watercolour mediums and papers. It was a lot of fun!! 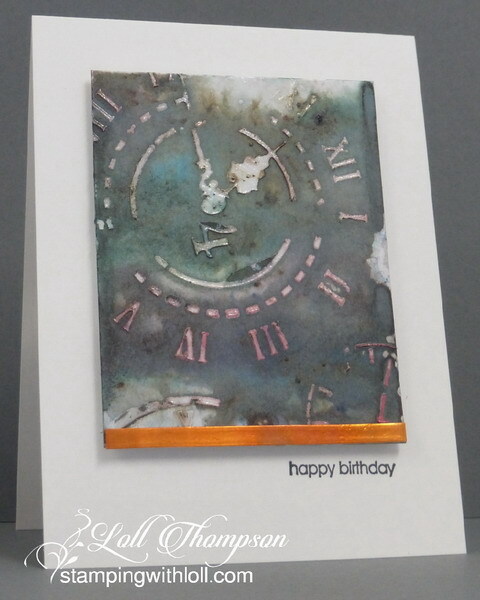 Christine brought the above embossed image (gloss gel paste through a stencil on top of coated card stock), and her bister powders. We sprinkled the bister on top of the stenciling and spritzed with lots of water. I got a little carried away (as I usually do) and added way more crystals than I needed so it turned out fairly dark. I thought this would make a great masculine card and I am always in need of those. I simply added a small strip of heated copper at the bottom and stamped a sentiment. Easy card to make since I already had the main panel done from yesterday. We usually have a fourth friend join us, but Shirl was not feeling well. We missed you Shirl!! I'll be back over the next while sharing more of our experiments. Thanks for stopping by and visiting. I'm fond of muted colors Loll and LOVE the color you achieved with bisters! This is a wonderful masculine card! Love the strip of copper on the edge- just the right amount of color. Not too much color at all. This is perfect for a masculine card! Love how that little strip of heated copper brightens it all up! I know you had a fun get together! Loll, it turned out so well! The copper really lightens up the darkness. It's a perfect masculine card! Thanks for hosting us! Fantastic card. That is a great stencil! So perfect for a masculine card. And great to use the strip of copper on this. I sure missed you all and I will look forward to seeing more of what you played with. Well done! It must be so much fun to share ideas and techniques when you can actually work on them together. I love what you've done with the stenciled clock face. That's the card I would like to give my dad on Father's Day! She would perfect for the occasion. Dzięku for inspiration, although I know that my card will be much worse. I want to have that kind of fun. p.s. do you know who makes that stencil? My sort of card and loving the colours, those powders and the strip of embossing...pure genius!